Vail’s Lindsey Vonn will not race next week at Beaver Creek as she recovers from a partially torn ACL in the same right knee she blew out at the World Championships in February. 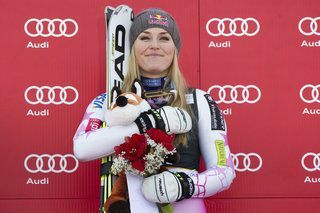 The defending Olympic downhill champion sustained the latest injury in a training crash at Copper Mountain on Tuesday. Lindsey Vonn announced today she won’t be skiing at Beaver Creek next week (file photo). The women’s World Cup, after a downhill, super-G and giant slalom Nov. 29-Dec. 1 on the new Raptor course at Beaver Creek, moves to Lake Louise, Alberta, Canada, the first full weekend in December. Vonn has won an astounding 14 of her American record 59 World Cup races at Lake Louise. Vonn had hoped to make her comeback at Beaver Creek next week before being derailed by her training crash at Copper Mountain. The Winter Olympics will be contested in February in Sochi, Russia, and Vonn has said she very much wants to defend her Olympic downhill title. “Lindsey is extremely appreciative of the outpouring of support and good wishes,” Kay said.